Here's my post for the week for the Creative Critterz Imaginations blog. 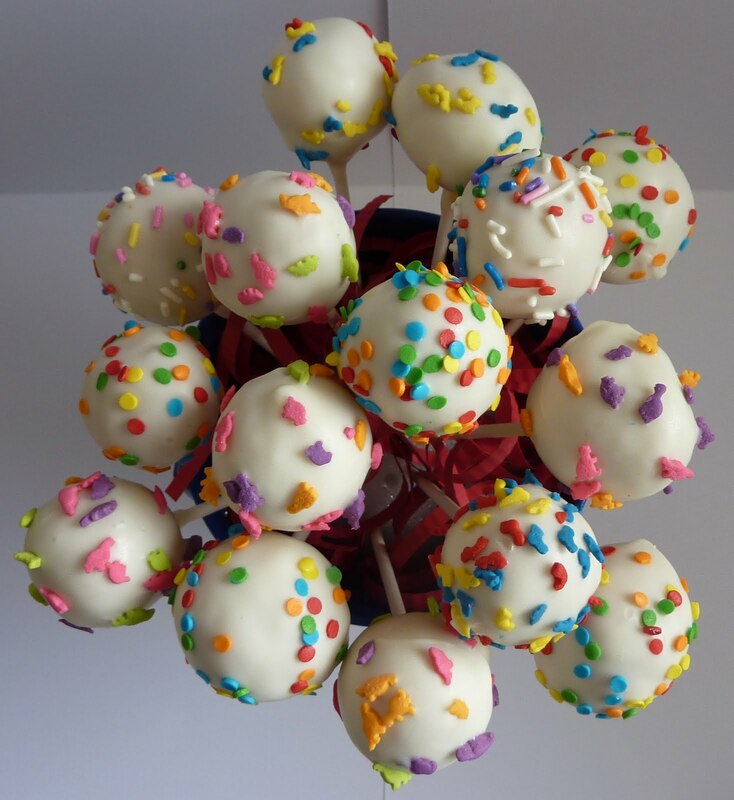 Last weekend I bought Bakerella's Cake Pops book and had my first attempt at making them. They were actually quite easy to make and so delicious! My brother and sister-in-law invited us over for a Memorial Day Barbecue, so I thought it would be fun to bring these along in some cute packaging. I recently came across the printable vinyl that came with my Imagine, and I thought it would be perfect for this project. I went to Michael's and bought a blue pail and a 4" styrofoam ball. Then I got to work on my Imagine. 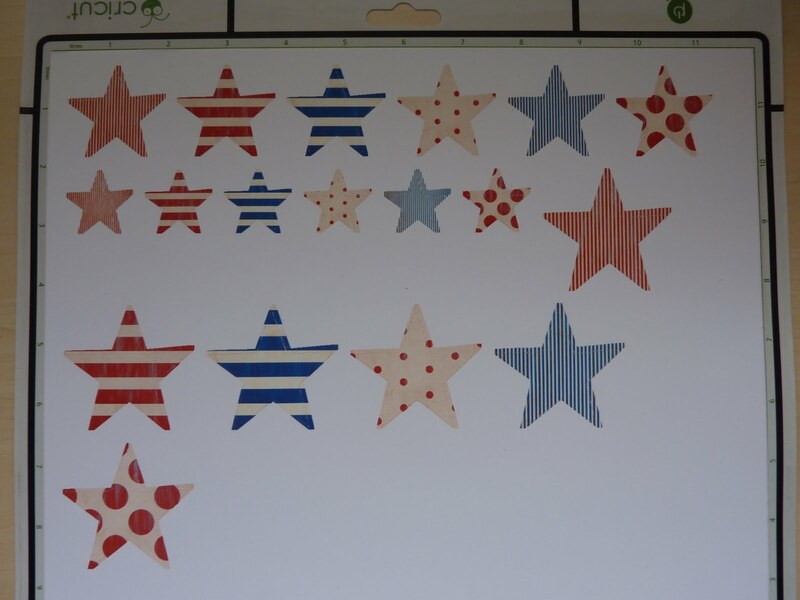 I selected 6 stars from A Child's Year, sized at 1.5" and filled with patterns from the Bucaneer Imagine cartridge. After printing and cutting, I kept them on my mat, and selected "Load Last" on my Imagine screen. This moved the 6 stars over from where they were last printed. I then clicked "Apply All" and changed the size to 1", and then print and cut. This is a much quicker method than going and clicking on each star individually. 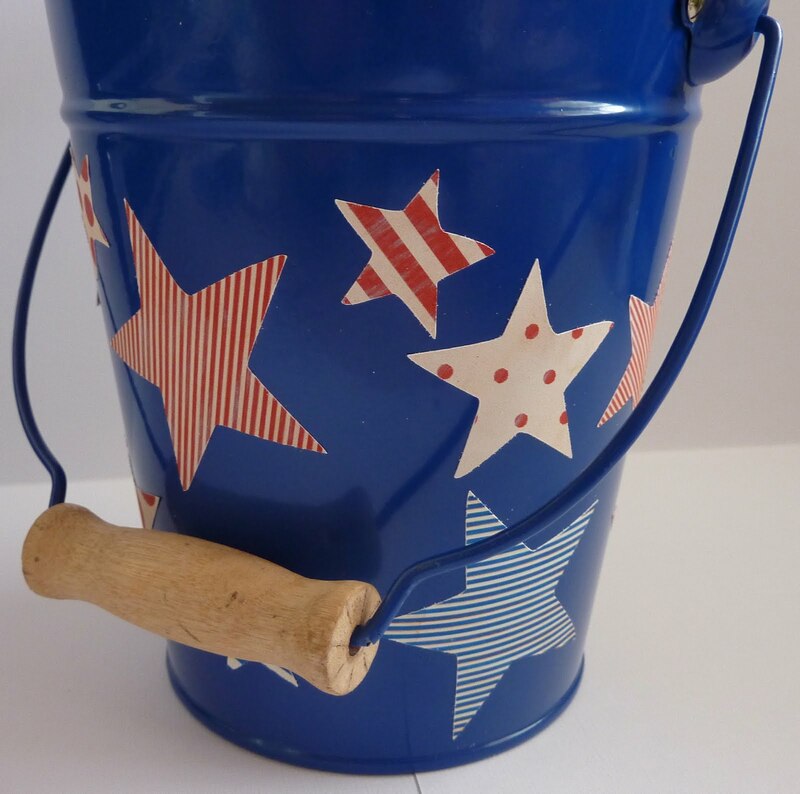 Finally, I repeated the process to make 2" stars and put all of the stars on my pail. 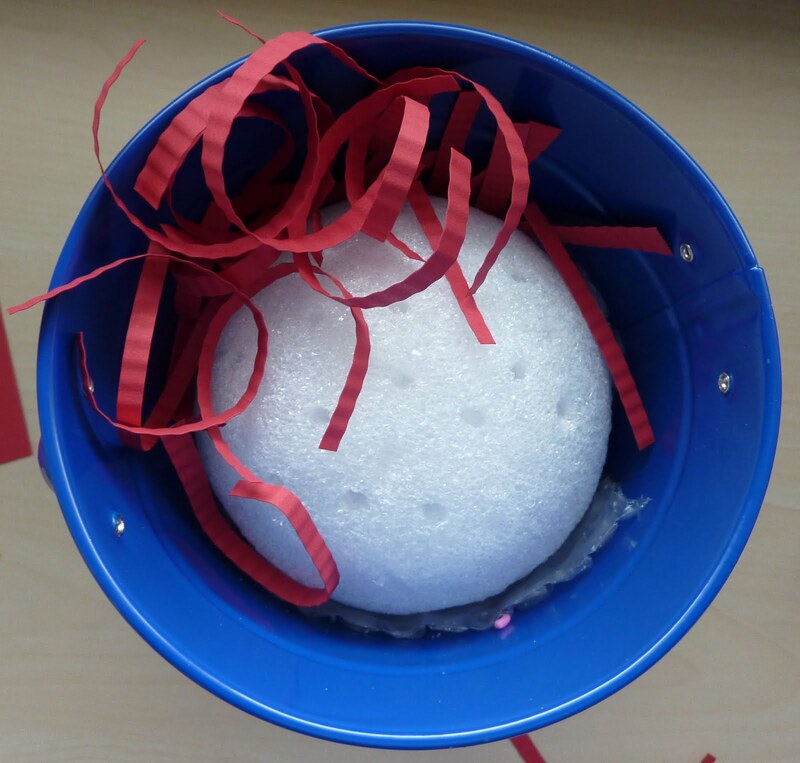 I put a little bit of bubble wrap underneath the styrofoam ball to raise it up a bit. 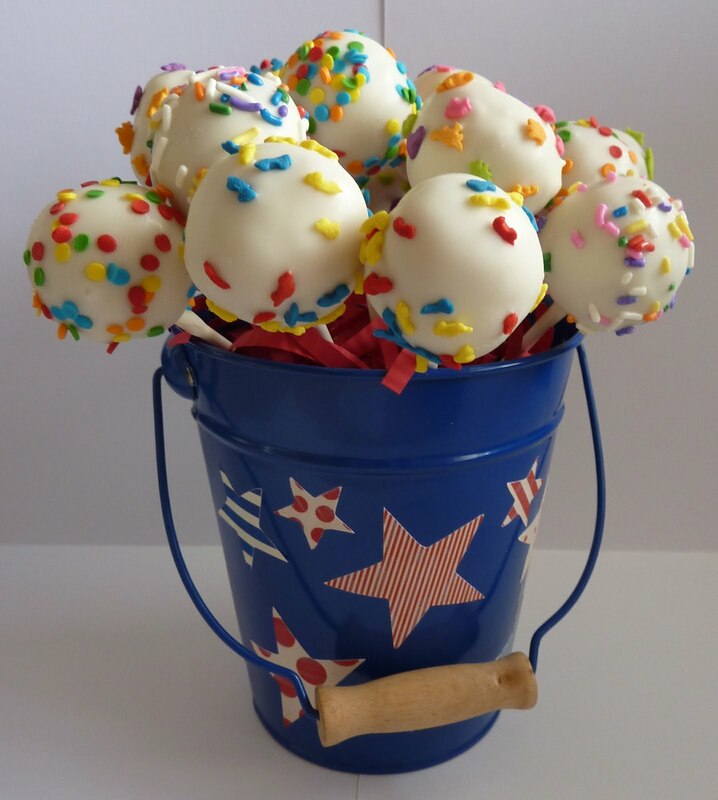 My styrofoam ball already has holes in it in this picture because I put all of the cake pops in it, and then I decided to add the red strips of paper. It was too hard to do this with the cake pops in, so I took them out, added the paper (run through my paper crimper, cut into strips, and then curled around my finger), and put them all back in. I bought the sprinkles at my grocery store. Unfortunately they didn't have any patriotic ones. Of course, I saw some cute ones at Michael's the next day. Isn't that always how it works? If I make these again for the 4th of July, I'll definitely be buying those! Katie that looks so YUMMY!. The Pail looks great too. I'm sure that was a hit. Katie what a great idea my daughter makes awesome cake balls I will have to tell about you inspired display! Look yummy and they are so easy to make love your ideal! yummy, what a neat idea!!! These are just PERFECT and YUMMY looking! I am sure they are going to LOVE this whole idea! I am sure they are YUMMY too! Okay the vinyl has sparked my interest... I am going to have to give this a try! Katie you ALWAYS amaze me!